Tradition. It runs strong and deep in weightlifting. Many coaches have used the exact same exercises and programs for decades with great success. Experimentation is often frowned upon and hence avoided. It is foolish, though, to overlook an entire world of exercises that have become popular in the last decade. By adding moves from another weight, discipline you can improve in areas you didn’t even realize you were weak in. The nature of Strongman training requires extreme balance in odd positions and the ability to move weight quickly. The best of these exercises compliment weightlifting and will not have a negative impact on your flexibility or athleticism. I guarantee that by adding these lifts to your off-season training, you will see more PR’s and feel more confident with heavy weight. The king of hand and grip strength exercises offers a full body challenge that will increase your foot speed and stability like no other. By deadlifting and walking (or running) with heavy weight, every muscle in your body works uniquely each and every time. Top level strongmen and women are using bodyweight or more per hand and cover hundreds of feet in less than a minute. By moving through space and time, the athlete’s stability is challenged and core strength is improved. The move can be performed with special handles, dumbbells, a trap bar or even kettlebells. Light weight can be challenged for max time and heavy weight for distance. Athletes even use uneven weights to provide additional stability challenges during training. Three work sets per week is enough to provide benefits. Many gyms have a few tires for use now, and for good reason: they work. By getting low and moving explosively, you place a unique type of stress on your back and traps. A proper flip is no less athletic than a power clean and encourages speed more than a traditional deadlift. A good flipping session places great dynamic stress on the posterior chain and will seriously challenge your cardiovascular system. Do not deadlift the tire or curl it with your arms! Everyone is fascinated by this move, and those who haven’t tried it are secretly curious. I recently covered the basics of the exercise here. A keg or a sandbag can be substituted for a very similar effect and can be a bit easier to acquire. I would argue is no other other exercise that has more overall benefits to any athlete in terms of comprehensive strength, coordination, and explosiveness. For weightlifters, I would avoid maximal loads and stick to reps of five to ten. This provides excellent conditioning and increased body toughness. For fun you can even do a stone or sandbag carry. Just watch your feet on the drop! You should expect a quick learning curve with these exercises. It wouldn’t be uncommon for an intermediate weightlifter to lift 25 to 50% more in just a few weeks after their initial attempts. Remember to keep the weights in check and use them as assistance lifts for your regular programming. Additionally, these moves have been known to increase muscle mass very quickly. Keep an eye on your scale weight if you are near the top of your class. Good luck, and enjoy some unique challenges. Weight training is in the blood of BarBend contributor Mike Gill. Learning how to lift as part of his conditioning for Jr. High School wrestling fueled a passion that has lasted now for 35 years. He has a background in all weight disciplines and has competed in Bodybuilding, Powerlifting and Weightlifting eventually finding his niche and turning professional in the sport of Strongman. Retired from competition, he now focuses on coaching and applying events from the most versatile weight discipline to other sports. 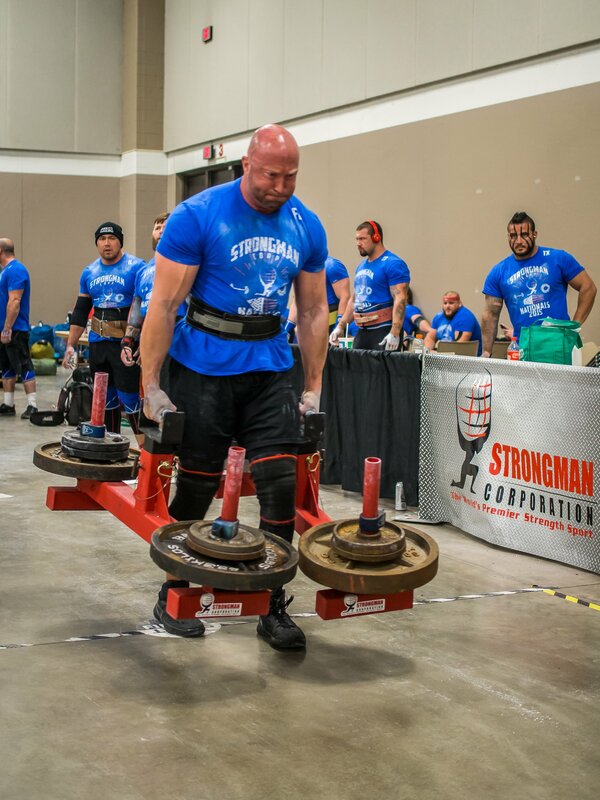 His vast knowledge of Strongman has been highlighted in his work as a color commentator for live broadcasts of the Arnold World Championships, National Amateur Championships, World’s Strongest Man Over 40 and World’s Strongest Woman.Not limiting himself to just working with weights, Mike has used his decades of discipline to work as a life coach and speaker. Additionally he can often be seen in New York City as a stand up comic.He can be reached for coaching at Michaelgill100 [at] gmail.com, @prostrongman on Twitter, Snapchat, and Instagram, and on Facebook.